New York jazz-rock fusion band XD 7 is currently on a three-week West Coast tour, with stops from Seattle to Los Angeles. XD 7 presents a high-energy live show full of hard-hitting, danceable grooves, raucous energy, and musical complexity. With two studio recordings independently released – “XD 7” (2012) and “Get!” (2013) – and a tour of California in summer of 2013, the band also maintains an active performance schedule in its home base of New York City. Led by trombonist and composer Jon Hatamiya, the band performed this month at the Sea Monster Lounge in Seattle; Carnation 4th of July Celebration in Carnation, Wash.; The Holland Project in Reno; Third Space in Davis; and The Bus Stop in Stockton. • Thursday, July 10, at 7 p.m. at Stanford Coho, 459 Lagunita Dr., Stanford. Call (650) 721-2262. • Tuesday, July 15, from 7 to 10 p.m. at Squashed Grapes, 2351 E. Main St. in Ventura. Call (805) 643-7300. • Wednesday, July 16, at 9 p.m., double bill with Jonah Levine at the Blue Whale in Little Tokyo’s Weller Court, 123 Astronaut Ellison S. Onizuka St., Suite 301. Must be 21 or over. Call (213) 620-0908 or visit http://bluewhalemusic.com. The other members are Patrick Bartley (alto sax), Xavier Del Castillo (tenor sax), Mike Bono (guitar), Kevin Bernstein (piano/keys/synths), Max Calkin (dat bass), and Joe Peri (drums). For more information, check www.sonicbids.com/band/xd7. Originally from Davis, B.A.C. 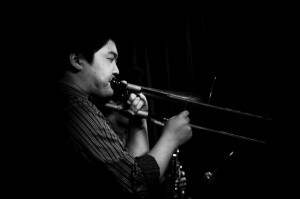 Endorsing Artist Hatamiya is one of the most promising trombonists to come out of the Sacramento area and is rapidly making a name for himself on both the New York and California music scenes. He was recognized in the Aug. 1, 2011 edition of Jet Magazine as the only trombonist on Wynton Marsalis’ list of “Who’s Got Next,” which highlighted the next generation of emerging jazz artists. Still early in his career, Hatamiya has already performed with a variety of artists reflecting his wide musical interests, including Dianne Reeves, James Moody, Taylor Eigsti, Stefon Harris, Dave Matthews Band, and the Jazz at Lincoln Center Orchestra with Marsalis, among others, and at venues such as Yoshi’s San Francisco and Oakland, the Jazz Standard in New York, the Monterey Jazz Festival, the Montreal Jazz Festival, Rose Hall at Jazz at Lincoln Center, and Staples Center. Hatamiya is also active as an educator, having been on faculty at the Stanford Jazz Workshop as a Mentor Fellow in 2012-2013, and as a composer and bandleader with the California-based modern jazz quintet Nice Young Men, as well as several other small ensembles under his own name.